There are only two ways you should see the country by wheeled vehicle: buy a convertible and take as few of your possessions as possible, or, the other way, take a bathroom, a kitchen, and all the comforts of home with you. Here’s how to do the latter without breaking the bank or breaking your mind. I enjoy the RV lifestyle, but when I was picking up an RV earlier this month for the big AER race down in lower New Jersey I struck up a conversation with a woman looking for a vehicle to take to a couple of weddings with her boyfriend. 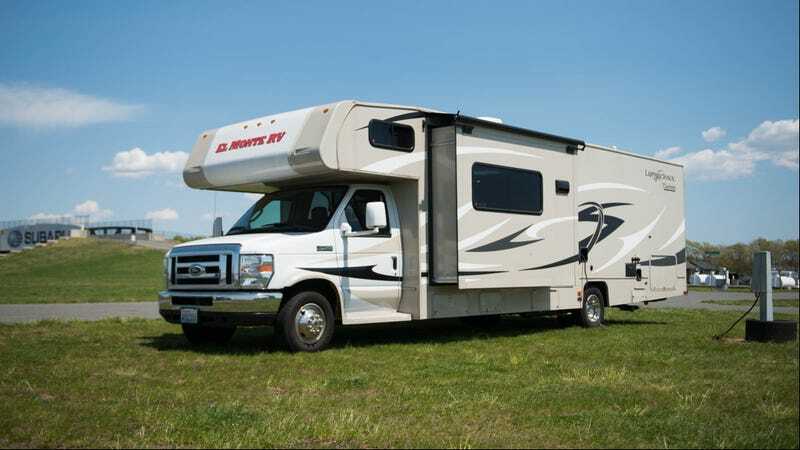 He seemed intent on getting as big of an RV as he could rent and she seemed more content with something like a Class C that they could drive easily and would fit comfortably carry them around. It reminded me that there’s nothing particularly obvious about choosing an RV and it’s not reasonable to expect everyone will have a chance to drive every kind of RV before they rent or buy one. I’ve driven a Class A bus and a Class B-style van, but I’d never driven a Class C with a cabover bed before. Thankfully, the RV industry has an outreach campaign called GoRVing.com and they arranged with El Monte RV to loan us one for the long weekend (it’s like a press car with a bathroom you’re supposed to use!). Now that I’ve reviewed all three kinds I think I can give everyone a pretty good idea of how to make sense of everything and help you end up with the RV you want and need. Here are a few questions that’ll help you narrow down what to buy/rent/borrow. 1. How Many Adults/Children Will Be Traveling With You? Modern RVs can be configured in so many ways and so many different platforms that you can comfortably sleep up to four adults with six children or, in a small van-based, as few as two people. In general, I’m a big proponent of getting as small an RV as you need. While there are nicer amenities that come with getting something big, there are also greater fuel and flexibility costs that come with them as well. For now, here’s a brief run down of the classes and what you should expect to comfortably sleep. For reasons I don’t entirely understand, the classing system from RVs starts with Class B as the smallest, Class A as the biggest, and Class C in between. We’re going from small to big so we’re going to start with Class B. Class B RVs in the United States used to primarily be full-size GMC, Dodge, or Ford vans converted into mild RVs with a bed, VCR, and curtains. Because Europe didn’t have these vans, they created an entire culture of less truck-like vans with high roofs that were ideal for making a small RV. In the last few years America has been the recipient of the new Mercedes Sprinter, Ford Transit, and now Ram Promaster (really a Fiat) chassis. This has been a great boon for consumers as they make excellent RVs. Last year I drove the Airstream Interstate and absolutely fell in love. For two people it offers the comfort and convenience of an RV (bed, bathroom, small kitchen) with the ease of driving and the fuel economy of a large van. If it’s just two people (or two people and a pair of small children) you could easily see the entire country in one of these. Prices range from about $60,000 for a Fiat-based RV up to $150,000 for the full-lux Mercedes Airstream Interstate. If you’re looking to rent, they run about $1200 for something like a Roadtrek Zion for a week. If you’re a single couple this is perfect and I wouldn’t recommend anything else. If you’ve got a couple of kids you’ll have to see how comfortable they are sleeping in a sleeping bag or sharing a twin bed. Class C RVs are the most common type of RV you’ll see on the road these days and offer an extremely wide range of amenities. There are almost no scenarios where you couldn’t get by in a Class C as they’re essentially big boxes. These RVs typically are based on the heavier duty Ford or GMC/Chevy vans, similar to what you’d get with a U-Haul. Almost all of them come with a gasoline V10 or V8, which is a downside as the engines tend to be thirsty. On the smaller end you’ve got something like a Winnebago Minnie Winnie, which is 25-feet long (RVs are generally identified by length) and sleeps 4-5 people comfortable in a bed located in the back, a bunk in the bed over the cab, and in a bench and a couch that turn into small beds. These retail for around $60,000 or rent for around $1,500 a week. On the highest end you can get something like a 31-foot Coachman Leprechaun, which has two slide-outs and can sleep a large family. The Leprechaun we got from El Monte RV included a dining area that turned into bunk beds, a queen-sized private bedroom in the back, a couch that turned into a full-sized bed, a dining nook that turned into a bed, and a cab-over bunk that could sleep one adult or two kids. It also had a separate bathroom and shower, which is a nice perk. One of these costs $80,000 to $100,0000 to buy and around $1700 a week to rent, depending on the season. The Class A RVs are the big boys, although you’ll notice that they sleep roughly the same as you’d get in the Class C RVs. This is largely because most Class A RVs don’t offer cab-over sleeping, although some are now building in platforms that drop down you can put an air mattress or mattress pad on. What you get with a Class A RV is a lot more space and a lot more comfort as well as prestige. Owing to their higher prices, many Class A RVs come with bigger kitchens, nicer bathrooms, and all-around improved amenities. The downside is they’re more challenging to drive, have hilariously simple suspensions, and are usually quite slow and thirsty as they typically share the same gas for V10 as you’d find in the Class Cs. This class also includes “Coaches” or which are essentially Greyhound Bus-sized chassis with diesel engines out back. They’re the highest dollar, nicest, most impressive way to travel. They’re also somewhere in the neighborhood of $600,000+ to buy and not really something an average person would consider. If you’ve got the means, go ahead, but I’m not including them here because it’s a super luxury option. There’s a lot of variation in this class with lengths starting as small as 22-feet going all the way up to over 42-feet. On the entry-level end is a 25-foot Thor Axis, which is also based on an E-Class Ford van and offers a nice group of amenities and space for a small family. These run about $80,000 and up for around $1,800 a week. Something with a custom chassis like a Fleetwood Revolution at 41-feet long is going to give you a more comfortable ride and often better overall fuel economy for the weight, but at a price, with these diesel pushers (as in the engine is in the rear pushing the vehicle) coming it at $100,000 on the low end with a weekly rental fee of close to $3,000. How Comfortable Are You Driving A Large Vehicle? Most RVs make great homes, but not all RVs make for great driving experiences. Most V10-powered Class A vehicles can be a handful as they’re both large and slow and easily buffeted by the wind. If you can drive a minivan you can drive a Class B, but size constraints might make that impossible. The Class C RV offers a nice compromise as they can be slow but they’re also built on a more compliant platform. As I said above, you’re always better of getting the least amount of RV you need. How Long Will You Be Standing Still? The one caveat to the “get the least you need” advice is a question of how you’re going to be using it. If you’re driving from point-to-point you may spend almost as much time moving as you are standing still. If that’s the case, you want something that you feel comfortable driving and fueling up frequently. However, if you’re going to be driving it to a family reunion and parking it for a week then you may want to get something that’s a little bigger with nice slide-outs and an awning. If you’re buying an RV you should consider if you want to park at multiple campsites or make camp in one place for a longer period of time, called seasonal or destination camping. Will You Have Access To Electricity And Other Features? Most RVs are self-contained units that have their own generator units and tanks for fresh water, grey water (water from the shower or sink), and black water (where all the Mountain Dew and WaWa quesadillas go). Many places you go will have power hookups and you can power most of your amenities off the provided cord. This is ideal and will save you money over the long term in most situations. Even if you can connect to a power source, you’re usually not getting enough energy to power the water heater (unless it’s an electric water heater) so you’ll have to use some amount of propane, gasoline, or diesel generation. You’ll also need the propane to cook if you don’t have an electric stove. Some newer RVs come with solar panels on the roof that can recharge the batteries during the day. Many, but not all, campsites will provide a “city” water hookup. This is a hose you connect to your vehicle and provides fresh water and, more importantly, water pressure so you don’t have to use your water pump. No matter what, you’ll eventually have to empty your black and grey water tanks, which can happen at a facility or can sometimes be done by companies with trucks. When selecting an RV it’s important to consider how long you’ll be away from these kinds of amenities. If there are eight of you in the middle of the desert far away from a dumpsite it might behoove you to get something with larger tanks so you’re not suddenly all forced to take showers and urinate outside. As a rule, most RVs have enough tanks to last four people for a few days without any additional effort. Can You Shower Where You Poop? Most Class B and Class C RVs will have a bathroom that also doubles as a shower. For me, this isn’t a problem, but some people are not as cool with that so you might want to consider the benefit of having either separate rooms for showers and toilets or, at least, having a dividing screen or all between the two. This goes for all sorts of amenities in RVs. Do you want a full-sized kitchen everywhere you go? Do you need a big refrigerator? How much still will you be storing? How long will you be living in it? The “least” RV for me may not be the “least” RV for you. Can You Stand The People You’ll Be Traveling with? The big Class C we got from El Monte RV came with its own room in the back, meaning that I didn’t have to talk to anyone when I slept. The Class B that I shared with Raphael last summer had us basically sharing a large bed. If you’re traveling with your family it might not matter, but if you’re traveling with friends or extended family you should consider how much personal space you need. Ultimately, I’m generally pro-RV as I like being able to be self-sufficient and make a home wherever, but after my varied experiences with these types of vehicles I definitely feel like you’re doing yourself a disservice if you don’t cross-shop. The modern RV is so fully featured that there’s almost no risk of being sold less than you need but you could easily end up buying way more than you’re ever going to use. Full Disclosure: The RV was arranged by GoRVing.com and provided to us by El Monte RV for a weekend for review. We provided fuel, bedding, and paid a dump fee. We also left a lot of beer in the fridge.